You wouldn't think being trapped in a room with six children for 8 hours over the course of a weekend is something I'd enjoy. But this past weekend was general conference, which I happen to love — even with all the wiggling and fidgeting. 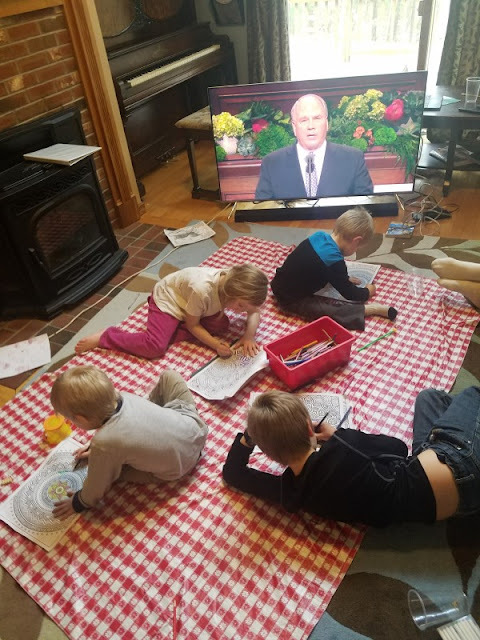 General conference is a twice-yearly meeting of members of the Church of Jesus Christ of Latter-day Saints, made famous among my children with the invention of Conference Snacks. 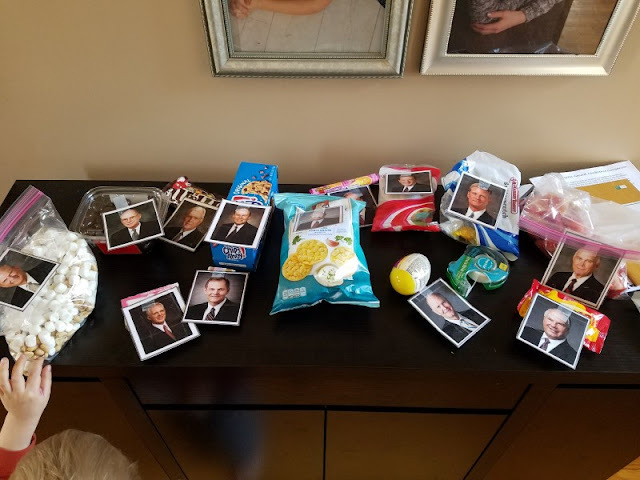 I print out pictures of the current prophet and apostles in our church, which the kids attach to various snack foods. 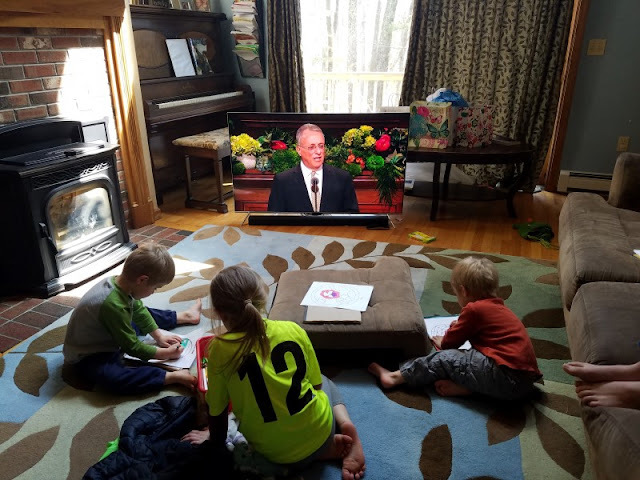 Then they all pay rapt attention to the rest of the general conference proceedings. At least long enough to figure out who's speaking next so they can eat his snack. 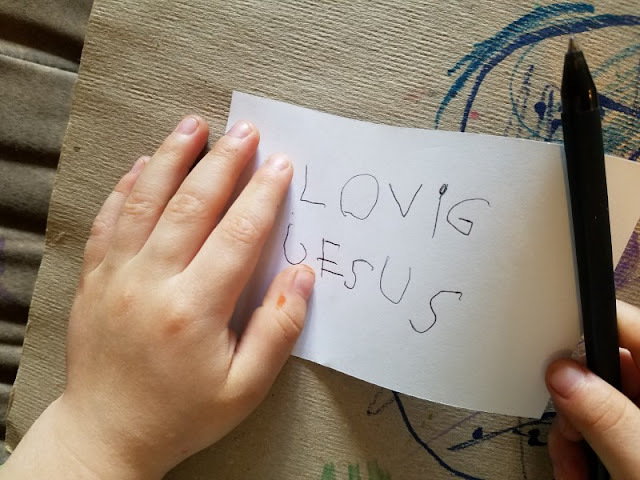 I adapted this idea a few years ago from Christina at Hands Full Mom, and it's become a major part of the general conference experience as far as my kids are concerned. 7-year-old: Are there any more speakers? 7-year-old: Oooh, I hope it's a candy person! Daughter: *wailing* We don't HAAAVE him! Me: Yes, we do. He's in the fridge. 7-year-old: [mistaking someone for Elder Cook, whose picture was on the Chips Ahoy] COOKIES!!!! 14-year-old: No, that's not the cookie guy. Or a certain someone (me) yelling, "Can you guys stop fighting about Tic-Tacs for five seconds so we can hear the prophet?!" 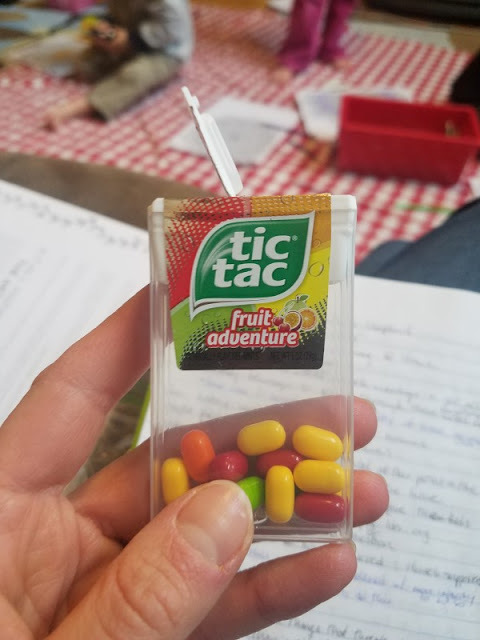 The Tic-Tacs heard round the world. Even though the kids are borderline obsessed with Conference Snacks, and even though they sometimes get bored and/or silly (they had a field day when someone accidentally pronounced the word "pew" weirdly and it sounded like "poo,") I was so impressed with how they were constantly making little comments that showed they were paying attention. Things like "Dad sings that song!" "hey, we've read that story!" or "you talked about that in church!" I also hand out little slips of paper to everyone and ask them to write down an idea from each talk. Even the 2-year-old took notes. Sort of. Turns out your own feet are a convenient and accessible place to jot down your thoughts. I also took notes, not just on the talks but also on the thoughts/feelings that came to my mind about what God wants me to do with that information. As much as I like the warm fuzzies I get while listening to conference, the longer I'm a member of this church the more I realize the most important part is what I do after it's over. Even though general conference speakers aren't assigned a topic, each conference seems to end up with a few themes. I'm thinking it's probably because they pray a lot to choose one and are guided from there. Increasing our faith in Jesus Christ. In the last year, our church has been making a lot of changes — not to our basic beliefs, but to the nuts-and-bolts workings of our programs and policies. The average Latter-day Saint is pretty active in running various parts of the church, and we've all noticed a recent effort from church headquarters to simplify programs and cut out unnecessary meetings and busywork. The point is to allow us to focus less on our "church jobs" and more on what's really important: our personal relationships with the Savior. Making our homes, not the church, the center of gospel learning for our families. We should look at church as a supplement to the teaching, reading, studying, and praying we're already doing at home, not a place where we can send the kids to Sunday School and call it good. 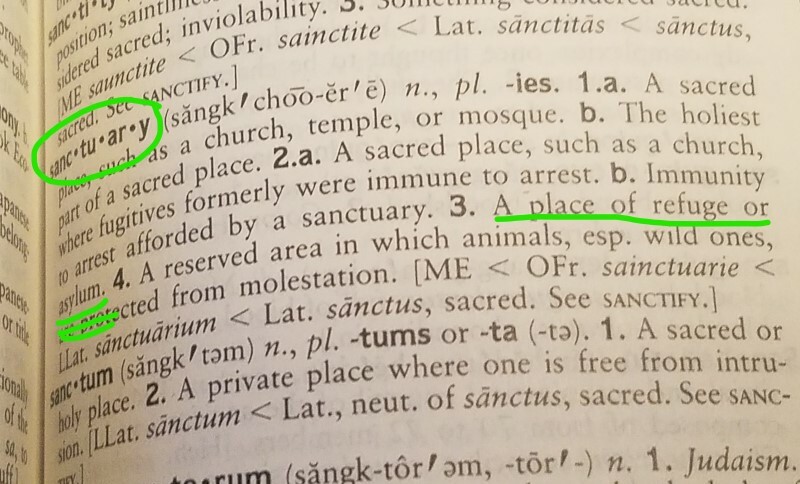 At least twice during general conference, I heard it said that our homes should be "sanctuaries." So we've got some work to do. Step One was to start a discussion at the dinner table that night. 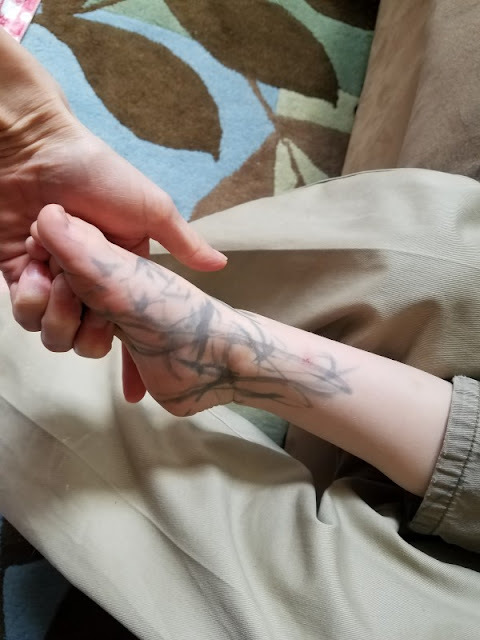 With 6 kids in the house it's pretty crazy and chaotic almost all the time, but I wanted to get their thoughts on the "home as a sanctuary" idea. 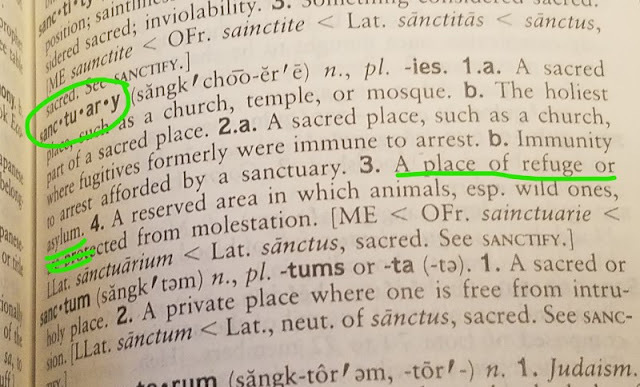 I asked the kids what they thought it meant, and after some discussion my 10-year-old looked up 'sanctuary' in the dictionary. Because we already think of our home as an asylum. An insane asylum. I lost it not too much later at Definition #4. Like I said, we're still us. But with personal inspiration from heaven and the direction of a prophet at the head of our church, I think we'll be okay. Oh my, those comments from your kids about the snacks are hilarious! When they're all grown and tune into the General Conference with their families, they'll probably look back with fondness on the brilliant snack system you set up. It sounds like it was a beautiful weekend for all of you-I hope you're able to push through and persevere in making the positive changes that you are inspired to enact! I can relate to that feeling of realizing that NOW the hard work is coming-there have been so many times when I've attended conferences or been on retreats and will be enthusiastic to center my life more wholly on Christ, but then two weeks later (or less, if we'll be honest) I find myself back in the rut of not making any changes. Following through on the inspiration we receive can be such a hard battle! Testing, testing. I just love the reactions your kiddos have to the snacks. What's going to happen on the off chance that you guys run into one of the speakers one time? "Mommy! Look! It's the Doritos man!" - And yes, I follow AnneMarie as well. She's great.